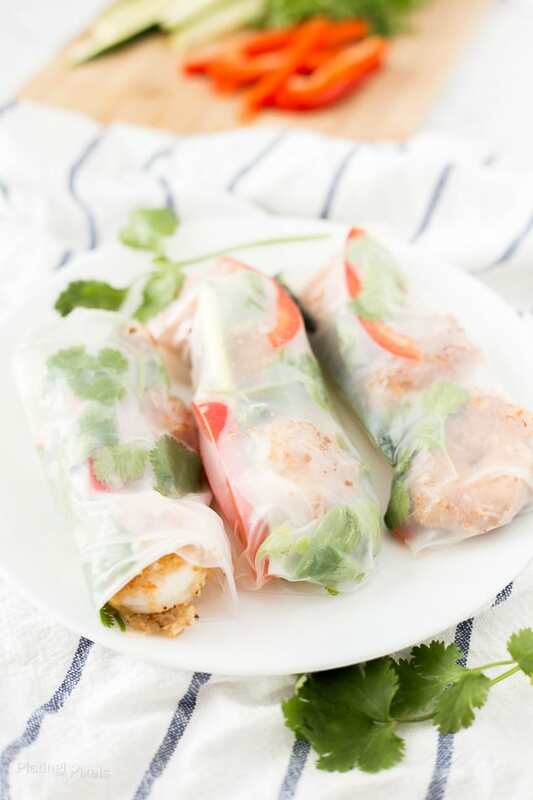 Restaurant style Lightened Up Coconut Shrimp Spring Rolls. Homemade coconut shrimp, pan-fried in coconut oil. Serve with cucumber, bell pepper, cilantro and Thai basil. Coconut shrimp sometimes has a reputation for being indulgent fried appetizers, most often served at seafood restaurants or happy hour menus. It doesn’t have to be that way. Lightened up coconut shrimp still has the same flavor and texture as the deep fried version, but pan-frying or baking is a lighter alternative. For this Lightened Up Coconut Shrimp Spring Rolls I’m pan-frying in coconut oil to give it a nice flaky crisp. Coconut shrimp is much easier that it seems. While a bit of fun hands-on prep is required, anyone can make it at home. Start with a breading that includes Japanese-style panko crumbs and unsweetened coconut flakes for reduced sugar. 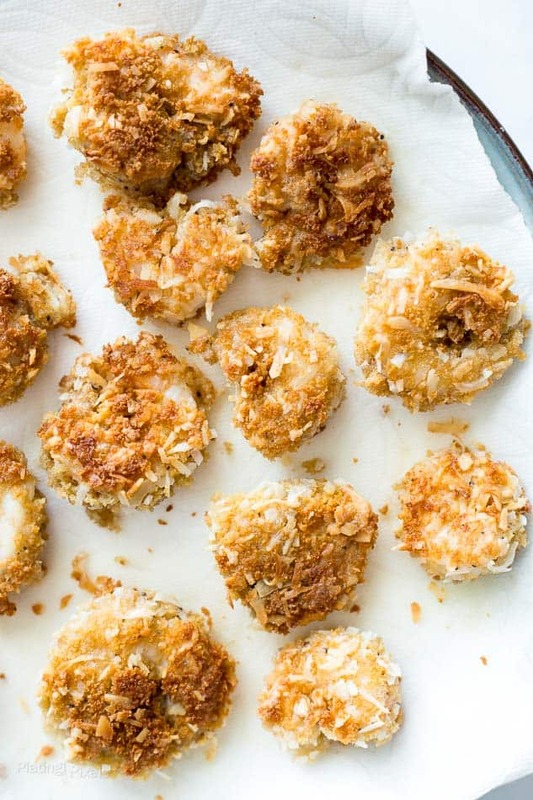 This gives the coconut shrimp that signature flaky, crunch coating. Pre-dipping the shrimp in whole-wheat flour and eggs helps it stick. You can enjoy the shrimp on it’s own, but Lightened Up Coconut Shrimp Spring Rolls is a complete meal. 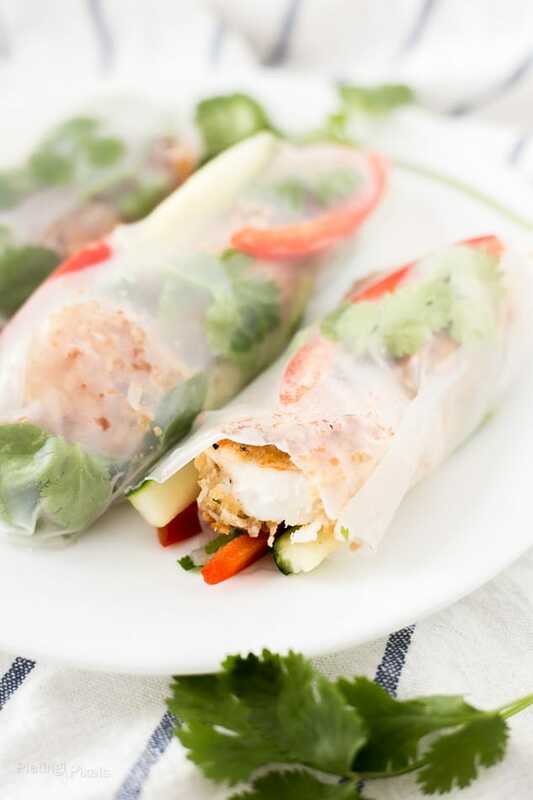 Add to spring roll wrappers, and add desired ingredients, such as cucumber, carrot, bell pepper and cilantro. Finish it off with a sweet and salty sauce for a fun restaurant-style meal at home you can feel good about. Texture: Tender shrimp with crispy coating and crisp veggies. Combine flour, sugar, salt and pepper in medium bowl. Place eggs in a separate bowl. Combine panko crumbs and flower in a third bowl. Dredge shrimp in flour mixture, then egg, then panko mixture to create breading. Heat coconut oil in a large pan to medium heat. Add shrimp and cook both sides about 4 minutes each, or until browned and cooked through. Remove and lay shrimp on a paper towel to drain. Place spring roll skins in warm water to soften then lay on a flat surface. Add about 3 shrimp, plus bell pepper, cucumber, cilantro and Thai basil to each. Tightly roll and serve with dipping sauce if desired.